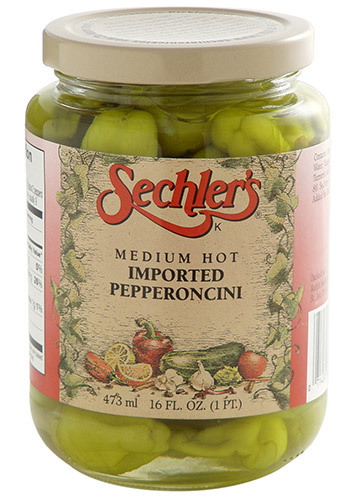 16 ounce Medium Hot Imported Pepperoncini are whole pickled pepperoncini imported from the Mediterranean. A great addition to pizzas and Italian dishes. From Shawna Jones of Oakland, California on 4/21/2018 . I was recently introduced to several Sechler's products from a friend. As a big fan of pickled anything, they make amazing products! I ordered the pepperoncini's and sadly, UPS lost my first shipment. Kathy was incredibly helpful, and shipped me a replacement order for free! I received that one and they're delicious! Will definitely be ordering from Sechler's again because they have great products and awesome customer service too!